On Saturday, 1st August 1914, the London Irish paraded at Chelsea to go for their annual camp on Persham Down. They en-trained at Paddington but spent less than one day in camp as orders for general mobilisation were received the same night and the Battalion was ordered to return to Chelsea. On mobilisation, every man received five pounds in gold. The only absentees were one one officer, who was in Canada and one soldier, who was visiting India. This rapid mobilisation reflected great credit on the Commanding Officer and his officers. Many recruits joined at this period and their selection and engagement stretched the capabilities of all the officers and NCOs. When all was ready, the London Irish set out to march to St Albans, where they were billeted. This took two days, with a night stop in bivouacs at Edgware and was a trying experience in the hot sun with the newly acquired transport and vehicles. At St Albans, the circus like cavalcade of tradesman’s vans and municipal water carts were replaced by army limbers, field cookers and ammunition wagons. Rigorous training began and continued in mud, rain, snow and east winds until the Battalion received orders to go overseas in March 1915. In September 1914, a reserve battalion of the London Irish, 30 officers and 990 other ranks, were raised in four days under the command of Lt Col Walter J Mathews. This became the 2nd Battalion and in November 1914, provided a large draft for the 1st Battalion in order to replace a number of older soldiers and others not physically equal to the tasks ahead. On March 9th 1915, the 1st Battalion, London Irish Rifles, left St Albans by train for Southampton Docks. The strength of the Battalion comprised 29 officers and 1,048 other ranks, who were accommodated in three transports. On disembarkation, the London Irish marched five miles to a tented camp. The Battalion entrained for Cassel on the 11th March and marched to billets at Winnezeele. St Patrick’s Day was celebrated in the proper manner but orders were received the next day to move by motor bus, followed by a march through the snow to Berbure. 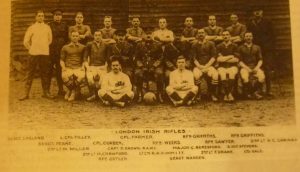 The London Irish Rifles maintained two front line battalions throughout the First World War with a third one, based in England, that provided reinforcement drafts. Sailed to France during March 1915, before seeing their first major front line action at Festubert during May 1915. They fought on the western front in both France and Belgium until the end of the war, finishing their war time service near to Tournai. Transcription of the First World War History of the 1st Battalion. Excerpts of the History of the 47th (London) Division 1914 – 1919, edited by Alan H Maude. A listing of Medals and Honours awarded to men of the 1st Battalion during the First World War. Diary and Letters of Corporal Sydney Speed. Harry Tyers at Ytres, March 1918. Signal Corporal, the story of the 2nd Battalion during 1914-18. History of the 60th (London) Division, by Colonel P H Dalbiac CB TD. The London Irish Rifles in Palestine, 1917. War Diaries of the 1st and 2nd Battalions. A Roll of Honour of men, who died while serving with the two Battalions during the First World War.